Given the choice of allowing an illegal installment or tearing it down, parks officials chose the latter — once again sending Snowden to political exile. 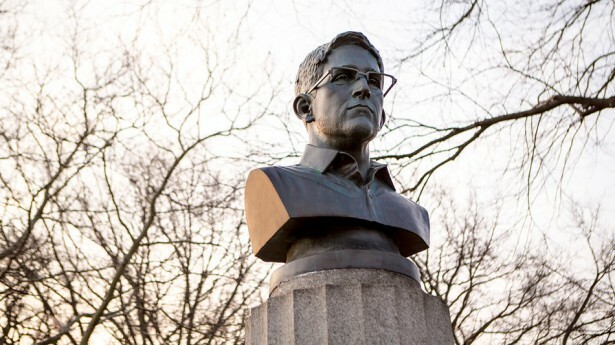 Runners and dog-walkers in Brooklyn’s Fort Greene Park were greeted with an unusual sight yesterday morning: a 4-foot tall bust of National Security Agency whistleblower Edward Snowden. The pair of anonymous artists responsible tapped arts and culture blog ANIMAL New York to film the guerrilla installation, which was covered and eventually taken down by the city parks officials by mid-day Monday. The artists’ developed a contingency plan that involved 3-D printing “an army of mini-Snowden heads.” Although, to-date, no such back-up forces have arrived, a group of locally-based political artists known collectively as The Illuminator projected a holographic image of Snowden in the place where the bust had briefly stood last night. Before dawn, the small crew donning construction attire hauled the 100-pound statue, made by a sympathetic sculptor on the West Coast, into the Prison Ship Martyr’s monument, built to commemorate the 11,000 American soldiers who died on British ships during the Revolutionary War. Snowden’s likeness was placed atop an empty column. Rather than bronze, the statue was constructed out of hydrocal, a substance often used in Las Vegas casinos to replicate castles and Romanesque statues in gaudy displays. They spared no detail, ensuring that the color of the bust and Snowden’s last name, spelled out at the column’s base, fit perfectly into the rest of the monument. Snowden, a former CIA contractor who leaked a trove of documents from his tenure in national security, now lives abroad in Moscow under fear of being charged with treason should he return to the United States. The case received a public boost in the fall as the subject of Laura Poitras’ Oscar-winning documentary “CitizenFour.” Highlighting the scheduled expiration of the Patriot Act on June 1, comedian John Oliver ran a humorous segment featuring an interview with Snowden Sunday night on his popular late-night show “Last Week Tonight.” Oliver asked Times Square pedestrians — just miles away from Fort Greene — to identify Snowden. Many could not, rendering Monday’s installation all the more well-timed. NYC couldna find some USMC “Crotch” commandos to topple the Saddamn thing?